Location: Imadate Town, Fukui Pref. Washi (Japanese hand-molded paper) made from fibers of plants such as kozo (paper mulberry) and mitsumata exhibits excellent durability, perhaps even up to 1,000 years of use. Since the fibers that compose the paper are of uniform length of about 1 centimeter (0.4 inch), the paper looks as beautiful as it is tough. 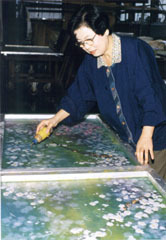 Echizen washi is a fine example of papers made by hand using traditional Japanese paper-making techniques. Imadate Town in Fukui Prefecture is known as the heartland of Echizen washi; paper has been made in the area since ancient times, and the name Echizen washi was cited in a text dated AD 774. From the 14th century Echizen washi was officially used by court nobles and samurai (warrior elite), and its reputation was thus firmly established. Fukui-han was a territory known as a fiefdom in the feudal government system of the Edo Period, and there Japan's first paper money was issued in 1661. These hansatsu, or feudal bills, only had currency value within the boundaries of the fief, and were made of Echizen washi. After the Meiji Restoration (1868), paper manufactured by the hand-made techniques of Echizen washi was still being used for bank notes. Japanese painting and woodblock print artists, calligraphers, and other artists love the characteristic beauty and softness of Echizen washi, and today more hand-made Japanese paper is shipped from Echizen district than from any other part of the country. 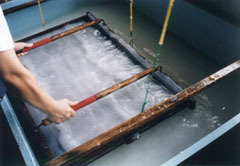 But the paper makers have not lagged behind the times; in addition to traditional products, they also make paper for use with word-processors or computer printers, and have also moved into totally new areas, such as paper deodorizers that take advantage of the absorbency of Echizen washi.